Rearranged home layouts, refreshed kitchens, and updated dining rooms take these modern home renovations to the next level. Take a look at the sleek renovations and remodels from the Dwell community that piqued our editor's interest this week. From the architect: "A vintage 1960's property, the existing house was divided into a series of small rooms with a decor from another era. 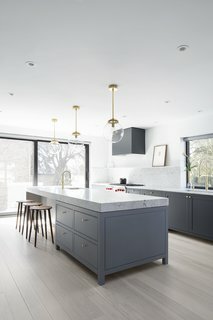 Our clients wanted to freshen up the look & feel of their new home and granted [us] full license to re-imagine how best to transform the house into a home designed for a thriving modern family.Our first instincts were to open the spaces to one another to create a less compartmentalized living experience. We demolished walls separating the kitchen and dining room, as well as walls between the living room and den. Large areas of new modern glazing were introduced to bring daylight into the home and to connect the main living areas to the outdoors and to one another.By combining the kitchen and dining experience in one large room a generous space was created where the family can easily interact or entertain in an open space that is modern and inviting. The large glass doors open to a new south facing terrace." From the project uploader: "The FA2 house, is a renovation of a 1960’s side split home, completed in 2017. Designed for a creative, middle-aged couple with adult children, the house is an exercise in accommodating opposite, yet complementary personalities.Without art on the walls, the art of the FA2 house is in the way it is lived in. The mélange of activities [available are] organized around the central structure, a bright light well connecting the basement to the top floors. The couple remains connected and visible to each other even when participating in varied activities: one could be tuning a car and the other cooking a meal, each master of their respective domains. The open structure of the house, both internal and external, extends into how it is used, interpreted, and lived-in by occupant and neighbor." From the builder: "We revitalized this 1972 Jon Condoret design with a full-house renovation ... by Linton Architects and decorated by Robin McCarthy. 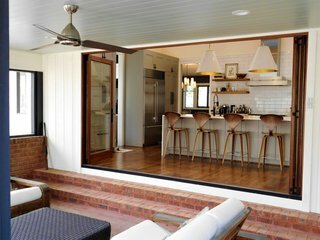 We switched the locations of the kitchen and dining room, adding a folding door unit out into the new screen porch for a seamless transition from indoor to outdoor eatery. The new kitchen boasts Statuario marble counters, custom cabinetry, open white oak shelving, top of the line gourmet appliances, and a new folding door from LaCantina out into the new screen porch. Jon Condoret was a huge part of the modernist house movement in NC, and we hope this project brings more attention to the one-of-a-kind work he has done throughout our state." 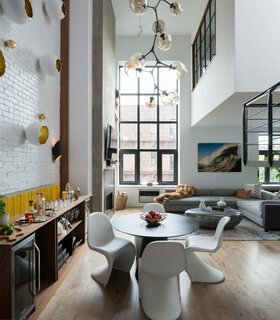 From the interior designer: "Combining style and function can be a difficult endeavor when it comes to designing space-constrained New York apartments, and our client for this project tasked us with this exact challenge. A financier who works from home, he was seeking to convert a dark, outdated duplex into a space that would serve as a living area, office, and place for entertaining. It also had to be comfortable enough for his girlfriend and durable enough to accommodate his 7-year-old bulldog. The couple loves to entertain, so it was important that the downstairs living area have a good flow between the kitchen, dining, and living areas. 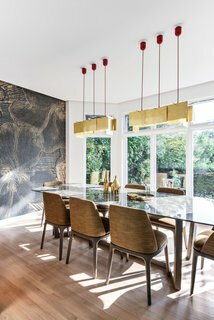 A dramatic chandelier from Lindsey Adelman hangs from the double-height ceiling, punctuating the space." From the project uploader: "The 3,500-square foot home was built in early 2000 and had a very dated interior which was fully gutted. The clients are well traveled, originating from Beijing and Sweden, and they wanted a contemporary space that reflected their travels.A bronze floral wallpaper from, Italian wallpaper company Skin Wall, was used as an accent in the dining room which tied into the mid-century fabric used on the Poliform dining chairs which were accented with the Ingo Maurer 24 Karat Blau M-Axel Schmid pendant."